The entrance to the CBXT studio is through the Juice bar and downstairs to the front desk. Heart Rate monitors will not be available five minutes before class starts, please arrive early it's first come first served. FIDI's Xtreme 1,000 calorie burning workout! 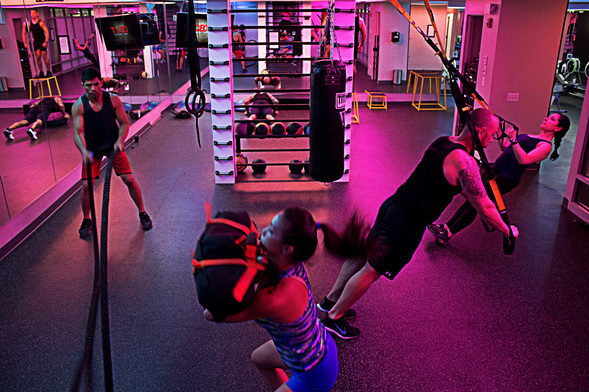 CompleteBody Xross Training also known as CBXT, this program incorporates a body transforming group of HIIT functional movements utilizing kettle bells, battle ropes, TRX, weights, Rowing, Bosu and the exclusive Queenex Bridge. All to give you the ultimate fat burning workout, right here in the Financial District. This is Cross Training at its best! CBXT now includes Heart Rate monitor training and Tablets displaying all the exercises to give you a more immersive experience. Track your calories and your effort level when wearing a heart rate monitor we provide.